Ian Tyson, in den 60er Jahren bekannt geworden als der eine Teil des Duos „Ian & Sylvia“, wurde außerdem als Komponist berühmt mit so bekannten Songs wie „Four Strong Winds“, von Bobby Bare 1964 unter die Country Top Ten gebracht. Daneben wurde Ian Tyson in seiner Heimat Kanada durch die „Ian Tyson Show“ zu einem Begriff, es war eine TV-Musik-Show, die fast durch die ganzen 70er Jahre über das CBC-Network ausgestrahlt wurde. Schon Mitte der 70er Jahre war allerdings das Duo „Ian & Sylvia“ auseinandergebrochen, die Ehe von Sylvia Fricker und Ian Tyson wurde geschieden. Ian Tyson zog sich aus dem Music Business zurück, kaufte sich in Longview - Alberta eine Ranch und betätigte sich als Viehzüchter. Jahrelang hörte man nichts mehr von ihm, bis plötzlich, 1983, eine vorzüglich produzierte L.P. auf dem Columbia Label von Tyson auftauchte. Thema: Cowboys und der kanadische Westen. Seither ist Ian Tyson wieder im Gespräch, vor allem, seit seine L.P. Cowboyography“ weltweites Aufsehen erregt hat, d. h. seit 1987. 1987 war eines der erfolgreichsten Jahre für Ian Tyson. Von der Canadian Country Music Association erhielt er drei Awards: Er wurde bester Sänger des Jahres, seine LP "Cowboyography“ wurde bestes Album und „Navajo Rug“ wurde beste Single. Und wenig später, im November 1987, bekam Ian Tyson auch noch den begehrten Juno Award (das kanadische Äquivalent zum Grammy Award) als bester Country-Sänger des Jahres." Mitglieder: Sylvia Fricker, geb. 19. 9. 1940 in Chatham, Ontario - Kanada Ian Tyson, geb. 25. 9. 1933 in British Columbia - Kanada Record Labels: Vanguard, MGM, Ampex Das kanadische Folk-Duo „Ian & Sylvia“ wurde in den 60er Jahren in Kanada und den USA stürmisch gefeiert Ihre bekanntesten Songs waren ,Four Strong Winds“, ,Trukker”s Cafe“ und „You Were On My Mind“. Anfang der 70er Jahre ging das Ehepaar dann mehr und mehr getrennte Wege. Ian Tyson hatte fast die ganzen 70er Jahre hindurch im kanadischen Fernsehen seine eigene Show und Sylvia Tyson-Fricker zog nach mit einer eigenen Radio Show. Die Ehe ging in die Brüche. Dann zog sich Ian Tyson auf seine Ranch in Alberta zurück und widmete sich der Viehzucht. 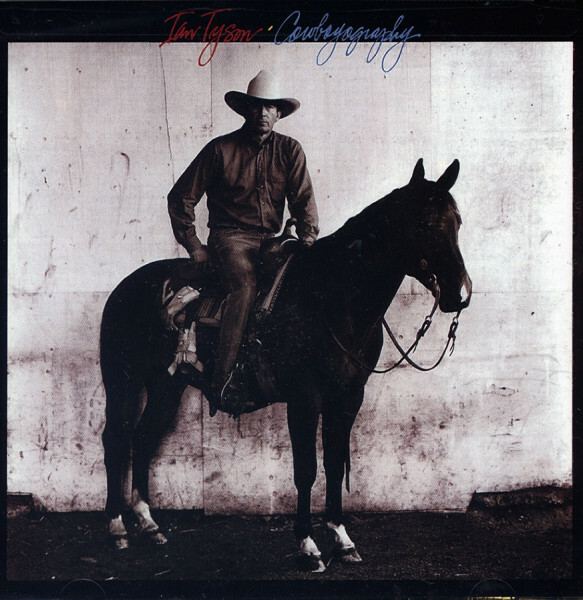 1983, völlig unerwartet, überraschte dann Ian Tyson mit einer neuen L.P., die er thematisch dem Cowboy Genre widmete. The most beloved duo of the pop folk era, Ian and Sylvia created timeless acoustic music. As musical trends changed, they effortlessly migrated to country rock. Writing independently, Ian Tyson and Sylvia Fricker penned such enduring songs as Four Strong Winds, Someday Soon and You Were On My Mind. They also encouraged other Canadian singer-songwriters that followed in their wake, most notably Gordon Lightfoot and Joni Mitchell. Ian Tyson was born September 25, 1933 to British immigrants in Victoria, British Columbia. A rodeo rider in his late teens and early twenties, he took up the guitar while recuperating from an injury sustained in a fall. His early heroes included bluegrass pioneers Bill Monroe, Lester Flatt and Earl Scruggs, which partially explains his distinctive rhythmic drive. Making his performing debut singing country songs at a Vancouver café in 1956, he later played with a local rock and roll band before moving to Toronto to work as a commercial artist. While working at local clubs, he met Sylvia Fricker, a striking brunette who sang with the emotion and power of a young Brenda Lee. Born September 19, 1940, in Chatham, Ontario, she came from a family that encouraged her interest in folk music. Ironically, she learned the old ballads through books, not recordings by other singers. As a result, Fricker's distinctive vocal style differed from her contemporaries. Although she took piano lessons and her parents bought her a guitar, Fricker seldom played an instrument on stage. Moving to Toronto in 1958, Fricker became part of the city's active folk scene. Newcomer Tyson often accompanied her on guitar, and by 1959 they were performing as a duo. Within two years the couple decided to turn professional. Moving to New York, they signed with Albert Grossman, a former Chicago club owner who was expanding his management operations. Grossman placed them on Vanguard Records, which released their self-titled debut album in September 1962. After hearing Bob Dylan sing his newly written Blowing In The Wind at a New York club, Tyson was determined to write his own material. He completed his first effort, Four Strong Winds, in a half-hour. Reflecting on a failing romance, the song's central character hopes for a future reunion while knowing the relationship is over. Fricker added the key line about 'the good times are all gone.' Four Strong Winds became the title track on Ian & Sylvia's second album, released in summer 1963. The song was a hit single in Canada, and spawned reverent covers by The Journeymen, Bobby Bare and Waylon Jennings. Royalties from Bare's hit single allowed Tyson to buy a 350-acre ranch in Newtonville, Ontario. In a 2005 CBC Radio One poll, listeners chose Four Strong Winds as the greatest Canadian song of all time. Tyson's song inspired Fricker to write her first effort, You Were On My Mind. Although completed in 1963, the duo held it back for their 1964 release, 'Northern Journey.' That album included another Tyson standard, Someday Soon. Despite both songs' commercial potential, Vanguard failed to release either track on a single. Mike Stewart's folk-rock group We Five turned You Were On My Mind into a No. 5 pop hit, while Someday Soon became Judy Collins follow-up to her first Top 10 single, a cover of Joni Mitchell's Both Sides Now. In June 1964 Tyson and Fricker married in Toronto, a move that surprised their close associates. Outside of their musical partnership, the two were often at odds. Tyson had a reputation as a womanizer and longed for his life on the ranch. By contrast, Fricker loved the pace and sophistication of Toronto and New York, if not the nightlife. As the folk revival waned, Ian & Sylvia went electric in 1967. The results initially disappointed longtime fans, but audiences for acoustic folk duos were fading. Leaving Vanguard, they moved to M-G-M with a new pop-rock sound, but by this time the audience was shifting again, this time towards psychedelia. Wisely, the couple embraced a country-rock compromise and began recording in Nashville. In 1969 they formed and fronted the group The Great Speckled Bird. Ampex Records released the band's sole album with minimal promotion in 1970. While it never found an audience, many musicians hailed it as a benchmark in country rock. The Tysons considered leaving music when the Canadian television network CTV offered them a weekly series out of Toronto. 'Nashville North' featured top country performers from the United States, along with such veteran folksingers as Jack Elliott, Mason Williams, Buffy Sainte-Marie and Gordon Lightfoot. Now raising a young son, Sylvia began reducing her regular appearances. With the second season, the program formally became 'The Ian Tyson Show,' lasting four additional seasons. In 1970 Ian & Sylvia signed a three-album contract with Columbia. Recruiting David Wilcox on lead guitar, the duo returned to an all-acoustic sound. However, Columbia President Clive Davis demanded the addition of heavily produced tracks that could attract pop airplay. Ian & Sylvia's two Columbia sets were spotty at best; a highlight of their debut album was a new reading of Tyson's often-covered Summer Wages. A third album never materialized, and Ian & Sylvia never recorded as a duo again. The couple amicably separated in 1974 and divorced two years later. Ian Tyson became a ranch hand in western Canada before rebirthing his career as a contemporary western musician. An iconic figure in new cowboy music, he has recorded more than a dozen albums since 1973 and now runs his own ranch in Alberta. He still performs and records, despite suffering irreversible damage to his vocal cords in 2006. Sylvia Tyson remained in suburban Toronto and continued recording as a soloist. For the past twenty years she has been part of the Canadian folk supergroup Quartette. In July 2010 Ian & Sylvia reunited to sing Four Strong Winds at the 50th anniversary of the Mariposa Folk Festival in Orillia, Ontario.